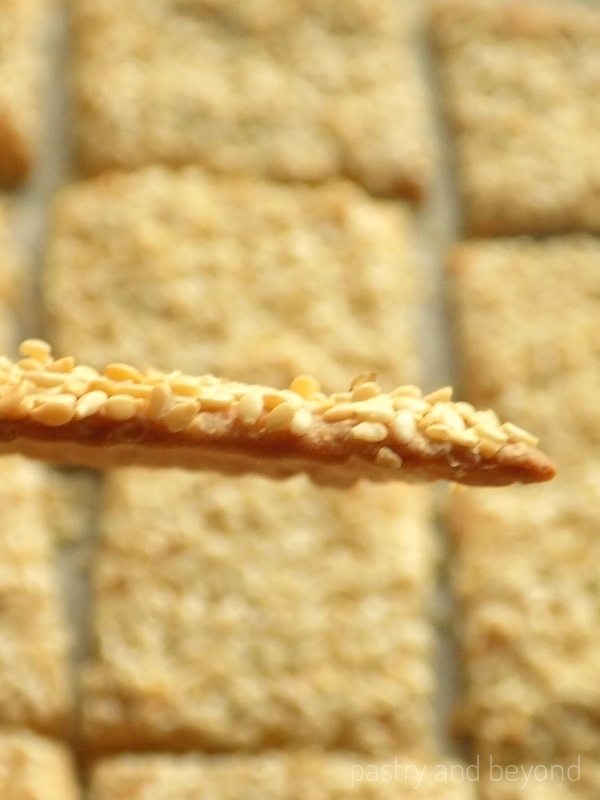 These vegan sesame crackers with olive oil are so delicious and easy to make. You can easily make these snacks with basic ingredients! Today I share my sesame crackers. 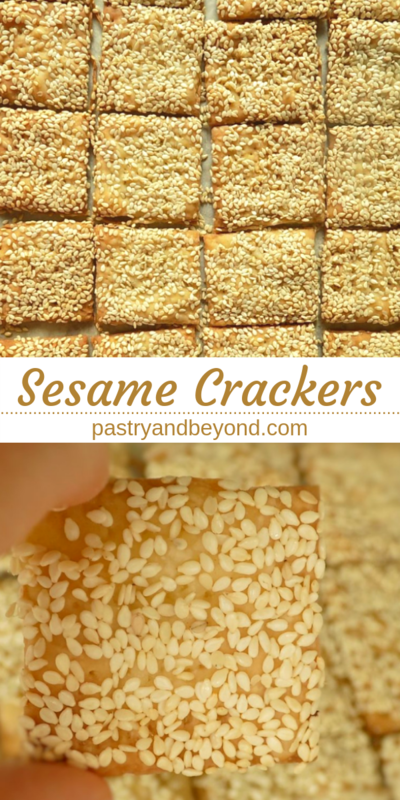 You can make this easy and yummy recipe whenever you want to eat crackers. This dough is so easy to make, takes almost 3 minutes to prepare. This is one bowl, no mixer needed recipe. After you mix all these ingredients, you need to roll out the dough. This dough is interestingly easy to work with. 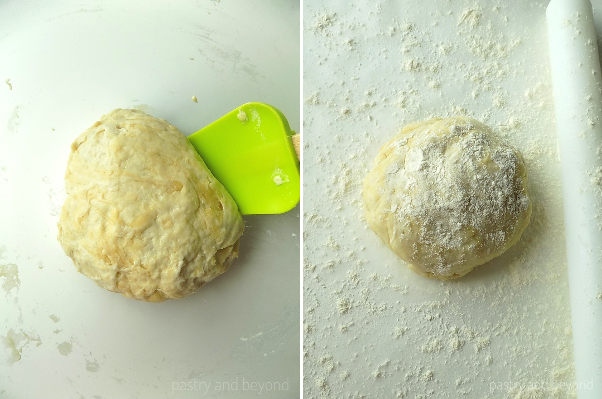 You can roll out the dough very thin, without any effort. 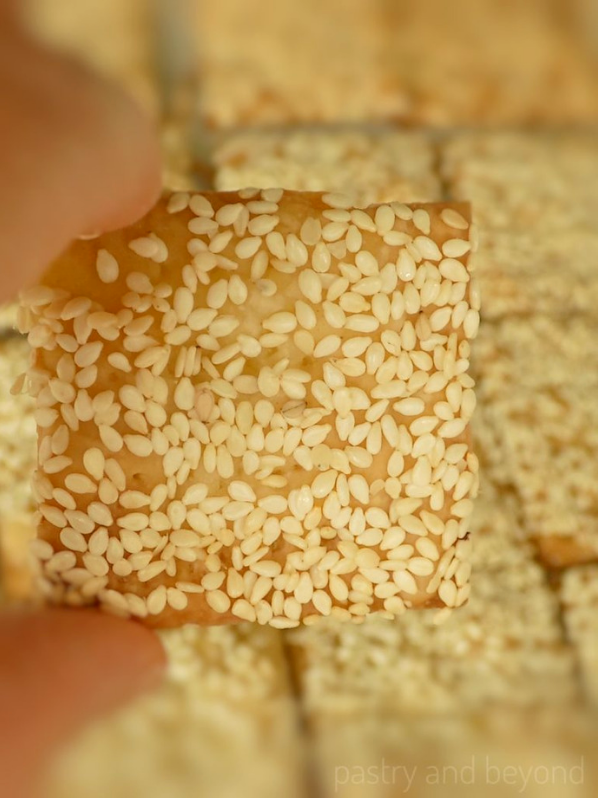 Are these Sesame Crackers Vegan? Yes! I use olive oil and I don’t use any eggs. Let’s go through the recipe! First I mix the flour, salt and sugar in a large bowl. Then I add in the olive oil and water, I mix all the ingredients with a spatula. The dough may seem very sticky at first. As I stir, it becomes softer, just little bit sticky but easy to work with. I cover the dough with a cling film and let it rest for 15 minutes at room temperature. Later, I divide the dough in half which makes it easier to roll out. I place the dough onto a lightly floured parchment paper. Then, I lightly sprinkle some flour over the dough and I flour the rolling pin. Next, I roll out the dough approximately 12,5*10,5 inches (32*26cm) long, 1/12 inches (2mm) thick. 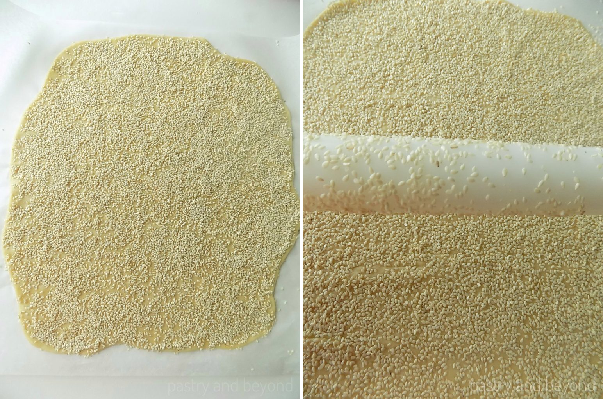 Then I cover the dough with sesame seeds and press with a rolling pin and go through the dough from the beginning to the end. There will be sesame seeds on the rolling pin which is normal. I repeat this step two times. I cut out the dough into almost 2 inches (5cm) squares with a pizza cutter and I make sure that all the squares are separate. Then I transfer the parchment paper into the baking sheet. Later, I prick the dough with a fork to prevent puffing. Although it is nice when it is puffed, it is hard to eat it as the pieces go all over the place. Finally, I bake at 375°F(190C°) for 12 minutes or until the edges become golden brown. I check the oven after 5 minutes if the dough is puffing. If it does, I use my fork to prick small holes again. When the edges are golden brown, I keep the crackers in the turned off oven for almost 5 minutes or until the top is golden brown. 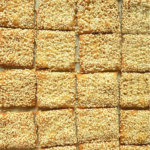 I remove the baking sheet from the oven and let them cool on the baking sheet for 10-15 minutes or until crunchy. 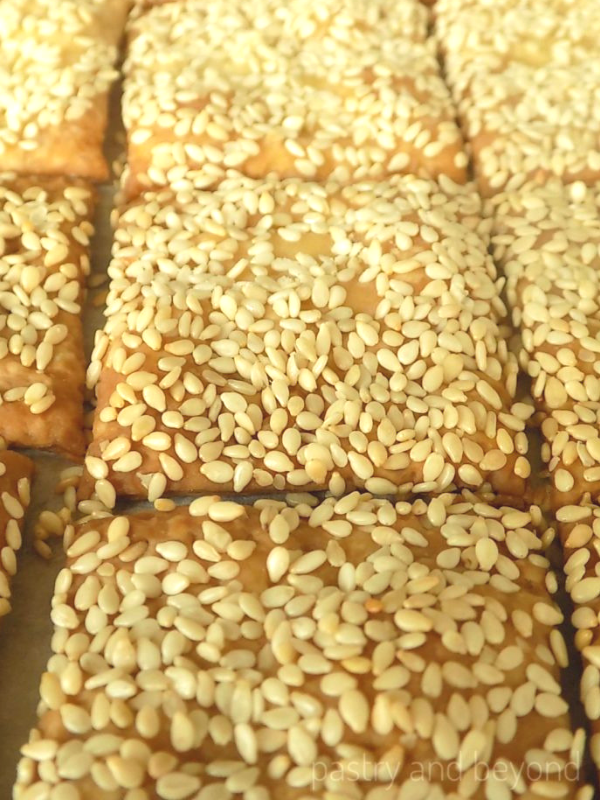 Enjoy these olive oil crackers! You should cut the dough properly before baking. 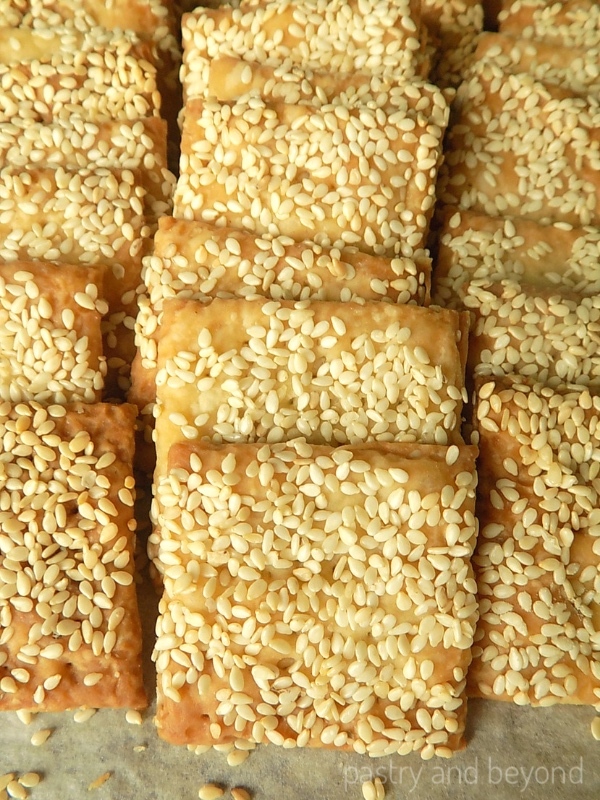 If you try to break into pieces after baking, the sesame seeds will go all over the place. It is important that you cover the dough with sesame seeds as some of them will be gone when you place them into the container, etc. If you like crackers, you may want to check my other recipes too: Nigella Crackers or Dill Crackers! 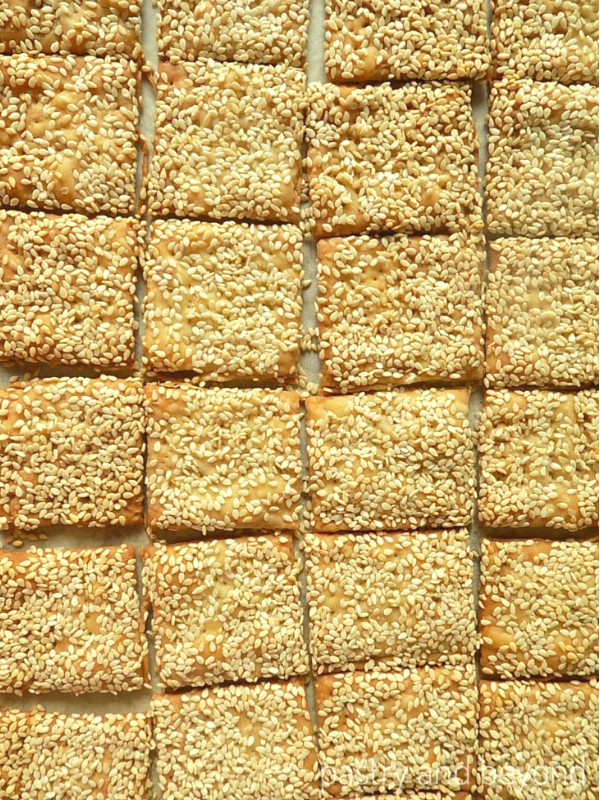 These sesame crackers with olive oil are so delicious and easy to make. 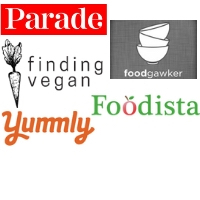 You can easily make these vegan snacks with basic ingredients! 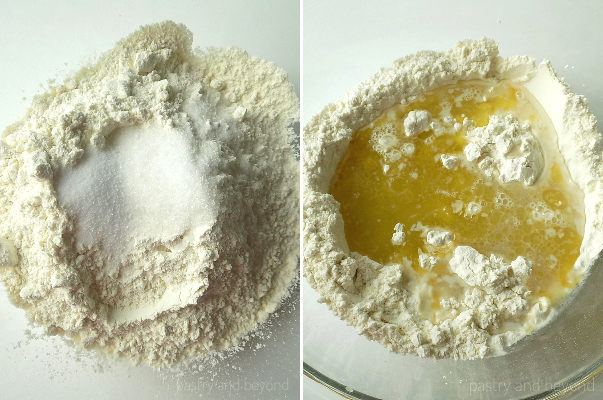 Mix flour, sugar and salt in a medium-large bowl. Add in the olive oil and water and mix very well with a spatula until you have a soft, just a little bit sticky dough. The dough will seem sticky but you will roll it out very easily. Cover the bowl with a cling film and let the dough rest for 15 minutes at room temperature. Divide the dough in half. Place the dough onto a lightly floured parchment paper. Sprinkle some flour over the dough. Flour the rolling pin. Roll out the dough approximately 12,5*10 inches (32*26cm) long, 1/16 inches (2mm) thick. 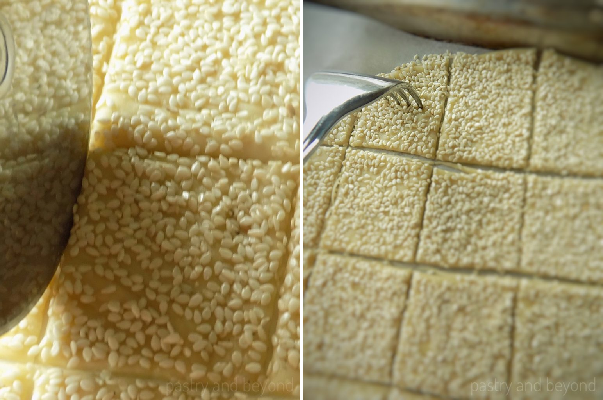 Cover the dough with sesame seeds and press with a rolling pin and go through the dough from the beginning to the end. Repeat this step (going through the dough with a rolling pin) one more time. 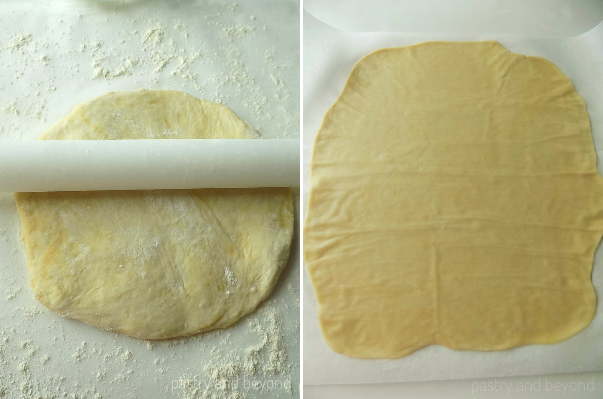 Cut out the dough into 2 inch (5cm) squares with a pizza cutter or a sharp knife. Gently transfer the parchment paper into the baking sheet. Prick the dough with a fork to prevent puffing. Bake for 12 minutes or until the edges become golden brown. Check the oven after 5 minutes. If the dough is puffing, use your fork to prick small holes again. When you turn off the oven, let them stay there for 5-6 minutes or until the top of the crackers turns golden brown. 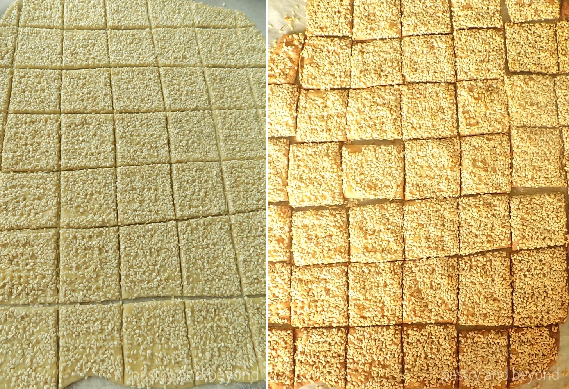 Remove the baking sheet from the oven and let them cool on the baking sheet for 10-15 minutes or until crunchy. Watch the crackers carefully as the color tells when to turn off the oven and take them out. Do the same steps for the other dough. Update Notes: I originally shared this recipe on January 3, 2017. Today I republish with new photos.